Boston police have yet to ticket a single bicyclist for running a red light or disrupting traffic since the launch of the Hubway bike-share program two weeks ago. But the reason may have little to do with lack of opportunity: Because of a loophole in a state law, the tickets wouldn’t be worth the paper they’re printed on. A newly enacted provision called for police across the state to begin ticketing bikers $20 for civil motor vehicle violations starting last January. For the first time, police could use the same ticket book for motorists and bicyclists, with copies of every ticket going to the Registry of Motor Vehicles. But, as police, court administrators, and Registry officials became aware this spring, the law also inadvertently did away with punishments for bicyclists who fail to pay tickets. Without any clear way to collect fines or punish those who ignore tickets, authorities have been left with a procedure reliant on the honor system. As a result, it appears that a number of police departments are choosing not to ticket bicyclists. Boston police, as of last week, had issued 60 warnings - but zero tickets - to bikers since the Hubway added 600 bikes to city streets. Boston police spokeswoman Elaine Driscoll acknowledged in an e-mail that the department was aware of the lack of teeth in the law. Across the river, Cambridge Sergeant Paul Timmins said his department, a leader in bike-law enforcement, has not issued a bike ticket since January. “It’s just this one sentence in the law that’s causing this whole problem,’’ he said. That “one sentence’’ can be found in Chapter 85, Section 11E of the Massachusetts General Laws. It starts innocuously by calling for police to ticket bicyclists as they would motorists. Keeping bicycle tickets and driver’s licenses separate makes sense on several levels - not every bicyclist drives a car, for instance. But the law, as worded, takes away the Registry’s only means to coerce bikers to pay civil tickets - by suspending or not renewing a driver’s license - without offering an alternative punishment. Registry spokesman Richard Nangle did not say how the Registry will pursue delinquent fines without such authority. “The RMV cannot . . . process bike violations as the RMV processes other violations,’’ he wrote in an e-mail. The law’s lone penalty pertains to bikers under the age of 18, who can see their bikes impounded for up to 15 days if they are ticketed. The law also forbids unpaid bike tickets from affecting a person’s car insurance, Nangle said. Nangle said several police departments have been writing tickets since January, but he declined to identify them or release the total number of tickets issued this year. Mary Rafferty, senior staff consultant with the Office of the Chief Justice for Administration and Management, which manages and administers the state’s courts, said legal minds are working to resolve the issue. Police instructor and lawyer John Sofis Scheft, whose consulting business, Law Enforcement Dimensions, is based in Arlington, said he’s seen similar issues in other public safety laws. Scheft said the law could be set right by adding one simple phrase. The law, called the Bicyclist Safety Law, was enacted in 2009 but the portion that called for ticketing bikers was delayed until January. 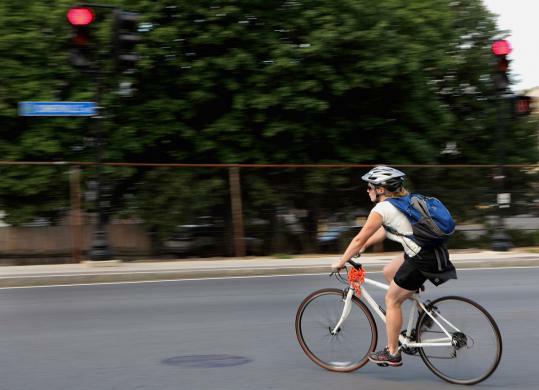 The law was brought about by MassBike, the state’s largest bicycling group, primarily to create stricter punishments for motorists who endanger cyclists. David Watson, MassBike executive director, could not explain how the ticketing loophole got written into the law, but said he supported fines for bicyclists who break the rules of the road. “There are laws and we expect bicyclists to follow them. We want police to write tickets,’’ he said. Without an immediate fix, though, public safety officials find themselves in an awkward position. Terrel Harris, communications director for the Executive Office of Public Safety and Security, said police departments should be writing tickets for bicyclists who break the rules, regardless of the current problem. Timmins said Cambridge police have been asking state officials for guidance since learning of the loophole this spring, adopting a “wait-and-see’’ approach before ticketing bikers. Cambridge, at least, has a fallback plan: Its officers can fine bicyclists for breaking city ordinances pertaining to improper driving, which was the only way any police department could cite a bicyclist before the statewide ticketing procedure was set in place. If a bicyclist fails to pay a Cambridge fine, a criminal complaint can eventually be sought. But few, if any, other Massachusetts communities have made the effort to put in place such ordinances or bylaws, police and bicyclists said.